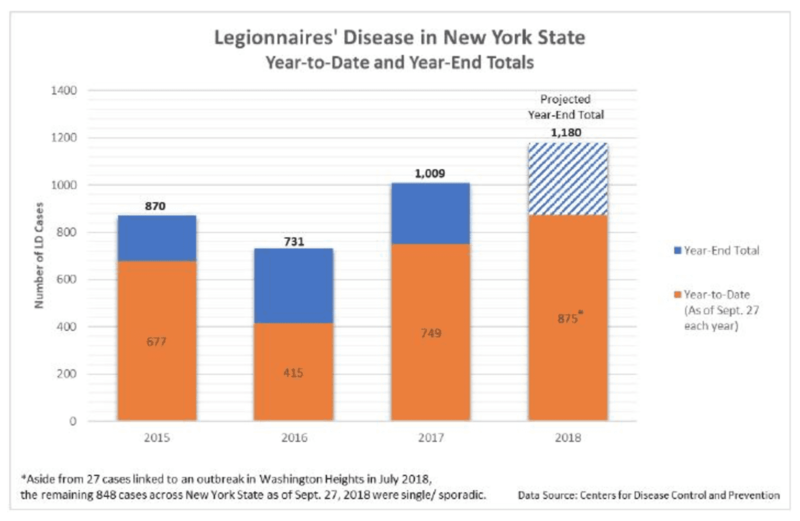 Albany, NY (October 4, 2018)—New Yorkers continue to contract Legionnaires’ disease at a record-setting pace. Data recently released by the Center for Disease Control and Prevention (CDC) shows that more than 128 cases of Legionnaires’ disease were reported across New York State within the past three weeks. In fact, during the same period of time, 348 cases were reported throughout the entire country. New York accounted for 37 percent of the nationwide cases. “The citizens of New York should demand that each case be thoroughly investigated to help identify the root source and for comprehensive ‘source to tap’ solutions to be implemented,” said Brad Considine, Director of Strategic Initiatives for the Alliance to Prevent Legionnaires’ Disease. New York water systems are not specifically tested for Legionella bacteria and cases of Legionnaires’ disease that are not part of a building (two or more cases) or neighborhood outbreak are not investigated. In addition, New York City is one of only a handful of water systems in the nation that receives a waiver from the Environmental Protection Agency allowing the City to avoid filtering most of its drinking water. 2018 year-to–date totals of Legionnaires’ disease cases across New York State continue to climb; outpacing the record-high totals experienced in 2017, and other recent years per CDC data presented in the graph at left. “The explosive increase in Legionnaires’ cases demonstrates that there is a greater need to monitor and treat the public water system to keep Legionella bacteria out of the homes and workplaces of New Yorkers,” said Tonya Winders, President and CEO of Allergy & Asthma Network.